You will require Visual Studio to compile Zandronum. In this guide, Visual Studio 2013 will be used, however it is recommended Visual Studio 2015 is used instead (the instructions are the same). Download the latest version of CMake from cmake.org. We will use this to generate the projects. For VC++ 2015, the latest nasm version is required. Currently, this is Version 2.11.08. The old FMOD Ex links were made private unless you have a license, so ZDoom has archived them at https://zdoom.org/files/fmod/. Used for downloading the soruce and fetching the Mercurial revision ID when compiling the build. Zandronum depends on DirectDraw for software rendering on Windows, so the February 2010 SDK release is required. OpenSSL is necessary in order for Zandronum to communicate securely with the account authentication server. Precompiled binaries for Windows are available from Shining Light Productions. You will want the latest non-light edition of OpenSSL 1.0.2 - the description of the correct package mentions "software developers". You should have a choice between 32-bit and 64-bit versions - you will most likely need the 32-bit version unless you are using CMake and select the 64-bit compiler when generating your build files. If the above packages do not work, you can compile OpenSSL yourself. This is a lengthy and complicated process, so be sure that the existing binaries of OpenSSL definitely don't work before you try this. Perl is necessary to build OpenSSL. If you don't have Perl installed already, install ActiveState Perl. NASM executable directory must be in the host system's PATH environment variable. Version 3.5 or newer is required. And of course, you will require the Zandronum source code to build Zandronum! You must clone the source with Mercurial to create a build that is compatible with servers. In the directory where you want to download the source, right-click on empty space, and go to TortoiseHg → Clone. Enter https://bitbucket.org/Torr_Samaho/zandronum as the source. If you want to clone a specific revision, expand Options, check Clone to revision, and enter the revision you want to clone. For example, if you wanted to download Zandronum 2.1.2's source, you'd enter ZA_2.1.2. Only available with the keyboard drivers from Logitech hardware. Open CMake (cmake-gui) and set the Where is the source code textbox to where you downloaded the Zandronum source code. Set Where to build the binaries to wherever you want the project files to be generated. Click Configure and select what you want to generate projects for. If it says there was an error, ignore it as we will solve it now. Make sure you set up all prerequisites correctly, and point CMake to the location of any missing paths. Then click Configure again, and point CMake to missing paths. LIB_EAY and SSL_EAY are OpenSSL libraries. YASM is unneeded as we already have NASM. Click Configure again and your CMake should look like the image on the left. Now click Generate. This will generate the project files. Now go to where you generated the project files and open Zandronum.sln. At the top, there will be a Build menu. Click it and click Build Solution. Now wait for Zandronum to build. It is a large project and will take time to build. If you encounter an error, see Troubleshooting below. 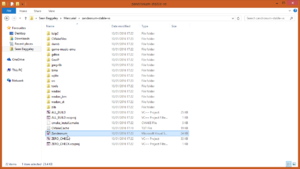 Once successfully compiled, zandronum.exe will be in the Debug folder in the project directory. zandronum.pk3 will be in the project directory. Just comment out the line that calls this, according to zdoom devs, it is only there to give info and doesn't actually affect the project. 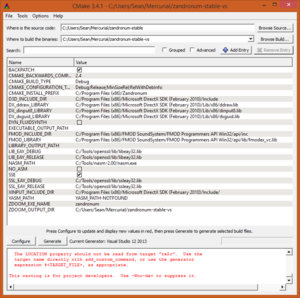 When using VC++ 2015, update to the latest nasm version. 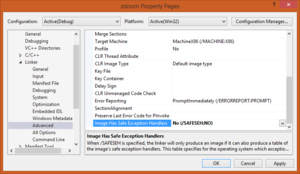 Set `/SAFESEH:NO` by going into the properties of the `zdoom` project and navigating to Configuration Properties → Linker → Advanced and changing Image Has Safe Exception Handlers to No (/SAFESEH:NO). This page was last modified on 17 November 2018, at 21:08.